Use a food processor to shred the peeled potatoes. Wrap potatoes in cheese cloth or allow to sit in a colander while your shred the onions. Shred the onions.Carefully heat the canola oil in a large frying pan. There should be at least a 1/4-inch layer of oil.Firmly squeeze the excess liquid out of the shredded potatoes and mix with the onions, flour, egg, salt and pepper in a large bowl.Test that the oil is hot enough by placing a single shred of potato into the oil. It should bubble and fry immediately. Gather a handful of the latke mixture, flatten into a round patty and squeeze out any additional liquid. Gently place in hot oil and fry until golden brown, about 3-4 minutes on each side.Transfer to cool on a wire rack or on top of clean paper grocery bags to wick away extra oil.Repeat with the rest of the latke mixture, replenishing the oil as needed. Serve hot. Top with apple sauce or sour cream! Line a large bowl with a clean kitchen towel and line a baking sheet with two layers of paper towels. Place the grated potatoes in the towel then squeeze out all of the liquid from the potatoes. Discard the liquid then place the dried potatoes back in the bowl. Once the latkes have drained, it's time to eat! If you want to take these grilled cheese latkes to the next level, you can add avocado or spinach to the cheese while cooking or switch it up with your favorite cheese. 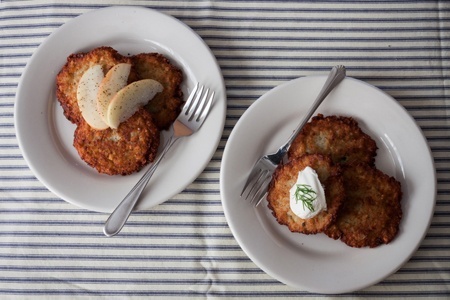 Serve on the side as a dip, or add a dollop to the top of your latkes. Shred sweet potato and onion. Rinse the potato under cold water, then strained them with a colander. Place a cheesecloth over the potatoes, and squeeze the potatoes to release as much liquid as possible. Discard liquid. In a large bowl, combine sweet potatoes, onions, eggs, sugar, matzo meal, cinnamon, gently mix well by hand. Heat oil in a large heavy skillet to 375 degrees. Scoop from the mixture (about 3 ½ ounce portions) and drop in hot oil. Cook about 2-3 minutes on each side until golden brown. Drain then in a paper towel or resting rack. Heat oven to 400 F. Place all of the ingredients in a large bowl and mix well. You can speed this process up by using the grater attachment on a food processor for the potatoes.Scoop approximately 1/4 cup of the mixture for each latke onto a very well-oiled baking sheet. Flatten to approximately 1/4-inch thick. Bake for 8 minutes.Flip the pancakes and bake, until golden brown, approximately 8 minutes before serving. Make smaller latkes by using 2 tablespoons, instead of 1/4 cup of the batter in each pancake. 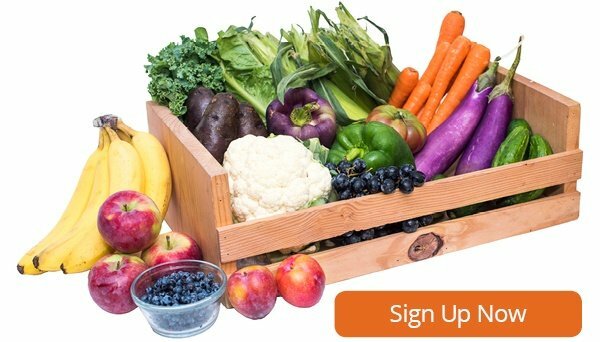 Replace 1 cup grated potato with grated sweet potato or yam. Add 1 tablespoon of minced fresh dill, parsley, or basil. Add 2 tablespoons finely chopped green onion. Add 1 clove pressed or minced garlic and 1/2 teaspoon seeded and diced chile pepper. Add 1/2 cup peeled and grated parsnip or carrot. Create Italian latkes by adding 1 tablespoon Italian spice mix. Go Mexican by adding 1 tablespoon minced cilantro and 1 teaspoon each of chili powder and cumin. 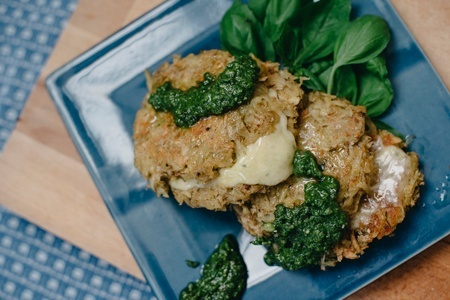 Add 1/2 cup grated vegan cheese for an over-the-top latke experience. For a gluten-free version replace the spelt flour with .